The Tien-Kung, also known as the Sky Bow, is a medium- to long-range surface-to-air missile (SAM) system operated by Taiwan. The system is composed of the surface-to-air missiles, the canisters, and the mobile fire control units. The fire control unit includes the phased array radar, communication relay, engagement control station, the launcher, and power plant equipment. [i]Development of the system first began in 1981 for its original variant, the Tien-Kung I, and was deployed in 1993 with a semi-active radar homing seeker for missile guidance, supported by two CS/MPG-25 target illuminator radars. The next variant of the system, the Tien-Kung II, was deployed in 1998. The Tien-Kung II included a slightly enlarged modified version of the original, and also replaced the semi-active seeker with an active radar homing seeker for increased range and capability. It is otherwise similar to the Tien-Kung I, relying on the same launcher. The most current variant is the Tien-Kung III which finished its operational test and evaluation period in 2011. [ii]The system also features a multiple target-tracking capability, Identification, Friend or Foe (IFF) capabilities, target identification and electronic counter-countermeasures (ECCM). [iii]It also has a higher effective range due to its solid propellants. The Tien-Kung system provides Taiwan with a domestically produced and highly capable air defense. Each new variant has allowed for greater range of defense. 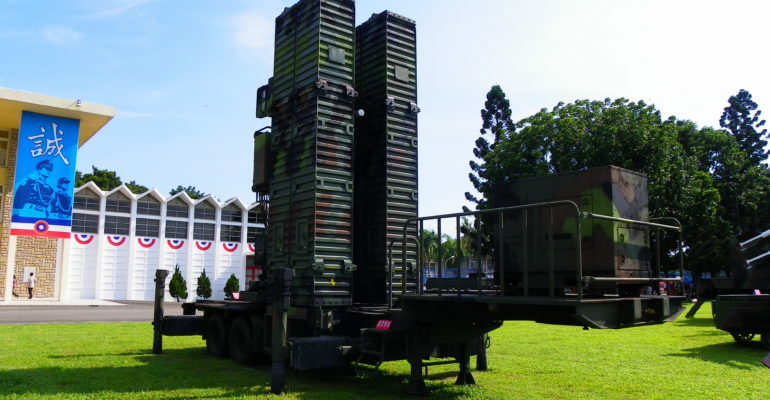 The newest variant, the Tien-Kung III provides medium- to long-range coverage that better ensures Taiwan’s ability to intercept threats earlier in their trajectory when they pose a lower risk. The Tien-Kung III is also capable of providing defense against some ballistic missiles. 2001:Development of the Tien-Kung III begins. 1998: First deployment of the Tien-Kung II. 1993: First deployment of the Tien-Kung I.